1) Who knew there was a world-class voice talent living in the Pine-Richland area? Well, evidently, Jackie Evancho knew! She started out by entering talent contests, including St. Barnabas’ Kean Idol. Acting was also in Evancho’s early repertoire. She performed in Pittsburgh Musical Theater’s version of High School Musical in 2007. She cut an independent album, Prelude to a Dream, and what a prelude to a dream it was. Evancho posted videos of her performances to YouTube. She was turned down twice in auditions for NBC’s “America’s Got Talent.” The third time was indeed the charm. The ladder to mega-stardom presented itself in 2010 after the nation heard her incredible classical song performances on “America’s Got Talent.” She came in second. Since then, she has recorded five albums, all of which achieved success on the music charts, and is the youngest artist ever to achieve platinum sales status. She sang the national anthem at President Trump’s inauguration in January and has released her latest album, Two Hearts, in March. 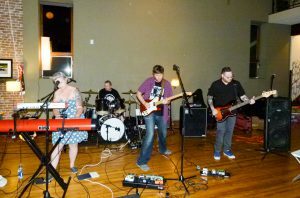 Tyler Jessup (l. to r.), Becki Gallagher, Andrew MacDonald, and Andrew Belsick of LoFi Delphi. Photo: Rick Handler.